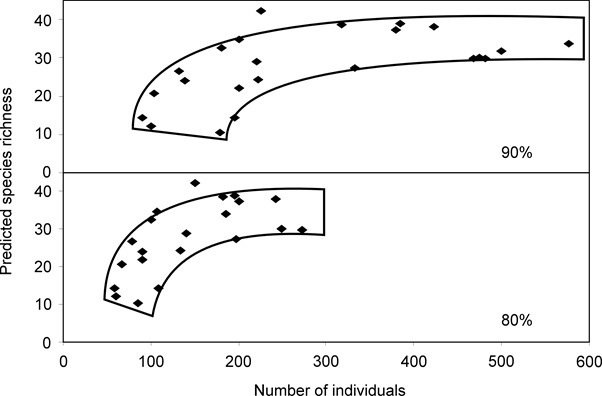 ‘average randomised species accumulation curves should be calculated for the different faunal groups (avifauna, mammals, herpetofauna) within each of the habitats surveyed’ (p31). ‘species inventories are decidedly more informative if accompanied by quantitative data on species abundance, ….’ (p31). This is quite simple and clear, however, very few of the fauna survey reports published in the past 3 years have done it correctly. In April 2013 we wrote about what a species accumulation curve (SAC) is, what it means and how to calculate and interpret the curve so we won’t go back into the details on that, however, we will remind readers that it is only one of many statistical tools available to estimate species richness (McKenzie et al. 2000, How and Cooper 2002, Thompson et al. 2003, How and Dell 2004) and can be used to assess the adequacy of survey effort to inventory species at a site (Soberón and Llorente 1993, Colwell and Coddington 1994, Hayek and Buzas 1997, Moreno and Halffter 2000). Although there are multiple ways to calculate SACs (see Soberón and Llorente 1993, Thompson et al. 2003, Diaz-Frances and Soberon 2005), it is not appropriate to graph a range of different curves for the same dataset and then expect the reader to decide which is the most appropriate measure. We would not report the mean, mode and median for a data set in a report and expected the reader to decide which was the best measure of central tendency for a data set, yet we often see multiple methods of calculating SACs graphed in reports [e.g. Chao1, Chao2, Jacknife1, Jacknife2, Abundance-base Coverage Estimator (ACE) and Incidence-based Coverage Estimator (ICE)] and the reader is expected to decide which one is the most appropriate. Species accumulation curves are used to estimate species richness for a particular habitat, with different techniques based on different assumptions and different approaches. For most of these techniques the lower and upper 95% confidence limits or the standard deviation can be calculated. Calculating an estimate of species richness by averaging the outcome of multiple of methods is inappropriate. Based on the data available and the assumptions underpinning each technique, a suitable method should be used to estimate species richness along with appropriate confidence limits. Issues that will affect the choice of an estimator include sample size, patchiness vs randomness of the fauna assemblage and overall abundance. Colwell and Coddington (1994) recommended that extrapolations to determine an estimate of species richness should be restricted to areas of reasonably homogenous habitat, such that if a project area has four broad fauna habitats, then four SACs should be provided; one for each habitat type. When describing the avifauna assemblage for three adjacent habitats, (i.e. an apple orchard, a vineyard and a banksia woodland), you would not combine the bird data as there will be obvious differences. Similarly, you should not combine data for different habitat types when calculating species accumulation curves. Similarly, it is inappropriate to report a ‘species accumulation curve’ based on the continual addition of data for new sites, such that the X axis is Site 1, Site 2, Site 3 etc. By adding data from new sites, particularly if they contain different habitats, will most often be progressively increasing the number of species in the inventory. One of the primary purposes of calculating a SAC is to indicate the proportion of the species recorded. If the curve has not reached an asymptote or near asymptote, then species richness can’t be estimated as inadequate data has been collected. Few fauna assessment reports indicate the percentage of species caught in each habitat type or provide an estimate of species richness. Of interest, you can estimate species richness for habitats when SACs are not provided in the report, simply by randomly resampling the data by trapping periods (i.e. days, Thompson and Thompson 2007). This can be a useful method of checking on the extent to which surveys have adequately sampled the fauna assemblage. A species accumulation curve, by definition, must progressively increase, but occasionally, SACs are presented in reports that go up, then down and up again. Insufficient data can provide a SAC that appears to approach an asymptote, but the graph is misleading, because if additional trapping was undertaken the curve would continue to rise. The variability in the shape of SACs is primarily due to variations in the catchable/trappable fauna assemblage structure, which can occur due to variations in ambient temperature, and among seasons and from year-to-year (Thompson et al. 2007). Daily variations in ambient conditions during a survey and the order in which species are caught affects the shape of a SAC (Thompson and Thompson 2007), and thus the reason for calculating and presenting an average randomised species accumulation curve. We are now seeing level 2 fauna assessment reports that either provide a ‘presence only’ species list for the entire survey site or per habitat type. This fails the test of providing ‘quantitative data on species abundance’ referred to above and it is not possible to calculate or estimate species richness from this information. Some methods of calculating SACs are more sensitive to sample size (e.g. the nonparametric estimators Chao1 and 2 and Jacknife) than others. If a fauna assemblage is under sampled, then its diversity will be underestimated. In addition, the order in which the samples are accumulated should be randomised in the calculation many times, as this provides for a more accurate smoothed curve from which the asymptote can be determined. As a rule of thumb, you are likely to have sufficient data to calculate an accurate asymptote if you have no singletons in your dataset. If estimates of species richness that are still increasing (i.e. you have failed to form an asymptote) with the addition of data, then you are likely to provide an unreliable estimate of species richness, in which case the Chao estimators maybe used to provide a the most valid estimate of the minimum species richness. So, is there a rough guide to how much survey effort to inventory the small vertebrate fauna in habitat? Yes, Thompson et al. (2007), using reptile trapping data from surveys at Cataby, Ora Banda, Cervantes, Australind, Atley, Yanchep, Yallingup, the Pilbara and the Tanami Desert in Western Australia, provided the following two figures to enable surveyors to estimate the trapping effort required to record 80 or 90% of the trappable vertebrate fauna. 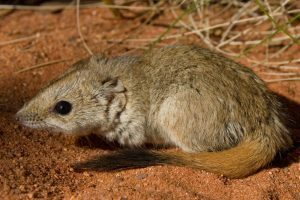 Rarely would a vertebrate fauna survey undertaken in WA to support an EIA collect / trap sufficient individuals to record 80% of the small vertebrate species in each habitat. We encourage everyone to reassess their own work (or that of their consultants) to ensure it is being done correctly. Colwell, R. K., and J. A. Coddington. 1994. Estimating terrestrial biodiversity through extrapolation. Philosophical Transactions of the Royal Society of London, Series B. 345:101-118. Diaz-Frances, E., and J. Soberon. 2005. Statistical estimation and model selection of species-accumulation functions. Conservation Biology 19:567-573. Environmental Protection Authority. 2016. Technical Guidance – Sampling methods for terrestrial vertebrate fauna. Environmental Protection Authority, Perth. Gotelli, N. J., and R. K. Colwell. 2001. Quantifing biodiversity: procedures and pitfalls in the measurement and comparison of species richness. Ecological Letters 4:379-391. Hayek, L. C., and M. A. Buzas. 1997. Surveying natural populations. Columbia University Press, New York. How, R. A., and N. K. Cooper. 2002. Terrestrial small mammals of the Abydos Plain in the north-eastern Pilbara, Western Australia. Journal of the Royal Society of Western Australia 85:71-82. How, R. A., and J. Dell. 2004. Reptile assemblage of the Abydos Plain, north-eastern Pilbara, Western Australia. Journal of the Royal Society of Western Australia 87:85-95. McKenzie, N. L., J. K. Rolfe, K. P. Aplin, M. A. Cowan, and L. A. Smith. 2000. Herpetofauna of the southern Carnarvon Basin, Western Australia. Records of the Western Australian Museum Supplement 61:335-360. Soberón, J., and J. Llorente. 1993. The use of species accumulation functions for the prediction of species richness. Conservation Biology 7:480-488. Thompson, G. G., and S. A. Thompson. 2007. Using species accumulation curves to estimate trapping effort in fauna surveys and species richness. Austral Ecology 32:564-569. Thompson, G. G., S. A. Thompson, P. C. Withers, and J. Fraser. 2007. 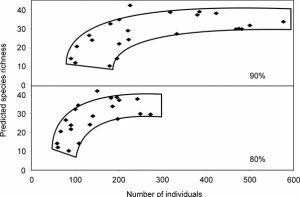 Determining adequate trapping effort and species richness using species accumulation curves for environmental impact assessments. Austral Ecology 32:570-580. Thompson, G. G., P. C. Withers, E. R. Pianka, and S. A. Thompson. 2003. Assessing biodiversity with species accumulation curves; inventories of small reptiles by pit-trapping in Western Australia. Austral Ecology 28:361-383.